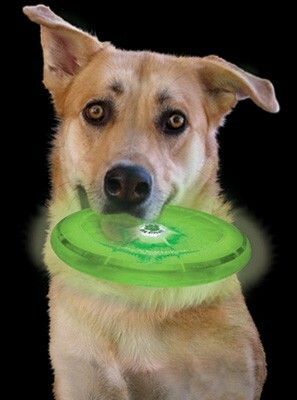 The Dog Discuit is a durable, chomper-proof, LED light-up flying disc that lets you and your Spot play fetch well into the night. The simple on/off button switch is protected by a bomber dog-proof cap that has been tested on some of the most persistent chompers around. The single LED lights up the entire disc and is powered by two replaceable CR2016 batteries (included) that provide 25+ hours of fetching fun. The Discuit can get wet; we just recommend that you dry out the battery compartment after you come inside. Around the globe, tails are wagging their thanks!